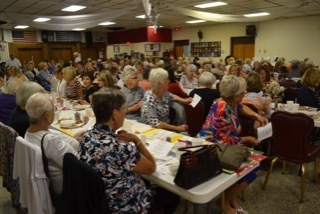 SEBRING, Fla. (Jan. 13, 2016) - To celebrate the 10th Anniversary of the all women’s networking club, Lunch Club Wednesday, over 150 women gathered at the Sebring Elks Club for lunch as they have always done the second Wednesday of the month. Only this time there was some added excitement in the air. Lunch Club Wednesday was the brain child of founder Diana Albritton. 14 years ago, Albritton won her battle with breast cancer and as a survivor wanted to do something for her community that would empower, encourage and support women. She came up with the idea of an all women’s networking club featuring a speaker each month that would offer topics on issues concerning women’s health and well-being with the main focus for the group to network, make new friends and support each other in a positive environment. 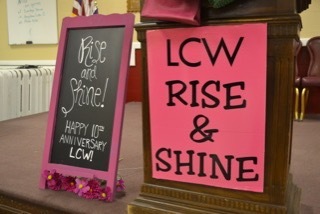 The mission of Lunch Club Wednesday is to “Rise and Shine!" “Diana has always been a ray of sunshine & beacon of hope in our community! 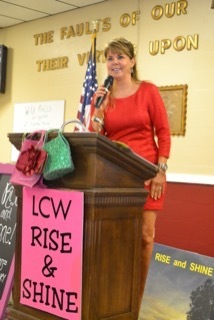 Despite whatever circumstances she finds herself in, she she rises & shines & faces them head-on, inspiring all of us to do the same!” said Kathy Mee who has been attending Lunch Club Wednesday since the beginning of the club. For the 10th Anniversary, Albritton encouraged women to “dress to match their personally” suggesting stripes, floral, polka dots or solid colors as a theme to the meeting. 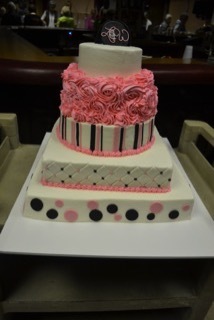 Matching the theme, as well, was a hand-decorated made from scratch tiered celebration cake from Cakes ’n More by Lisa Thomas who has been a member for more than 7 years. The club always meets at the Sebring Elks Lodge the second Wednesday of ever month to enjoy “Rise and Shine” speakers, honor one member with the “CeCe Courage Award” and presentation of flowers donated by Hobby Hill Florist, a chance to win member donated door prizes and also visit and shop with over 25+ member showcases set up in the banquet room and there’s a Birthday Celebration “Cash or Card” Wheel donated by AllStar Car Sales and Right Card Right Time. Plus, the club offers a $50/$50/$50 cash grand prize with a min. $1.00 purchase for a chance to win. Doors open at 11:30 a.m. and program starts at 12 noon. Lunch Club Wednesday is open to women of all ages. There are no membership fees or dues, you only have to pay $10 for your lunch. Once you have come twice in one year, you are officially a member! For more information on Lunch Club Wednesday and its members, please visit www.LunchClubWednesday.com.